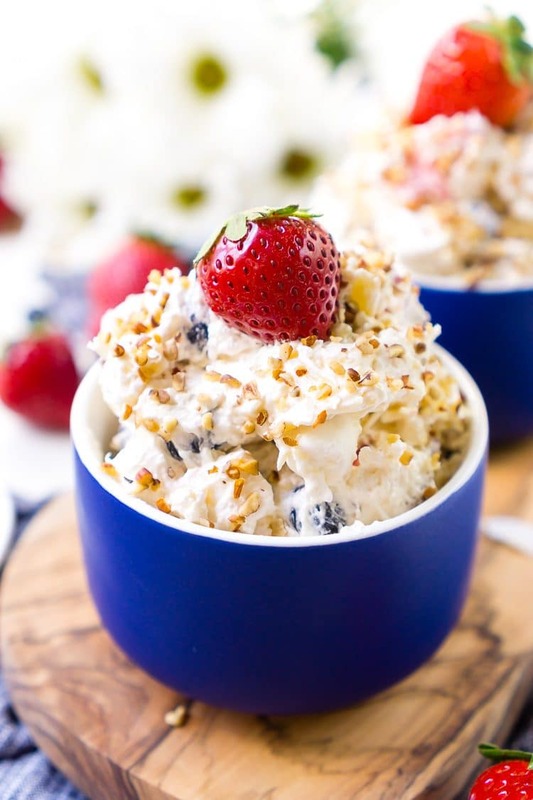 This Red White & Blue Ambrosia Salad is a delicious, no-bake, retro dessert recipe that’s easy, addictive, and loaded with strawberries, blueberries, coconut, and pineapple! 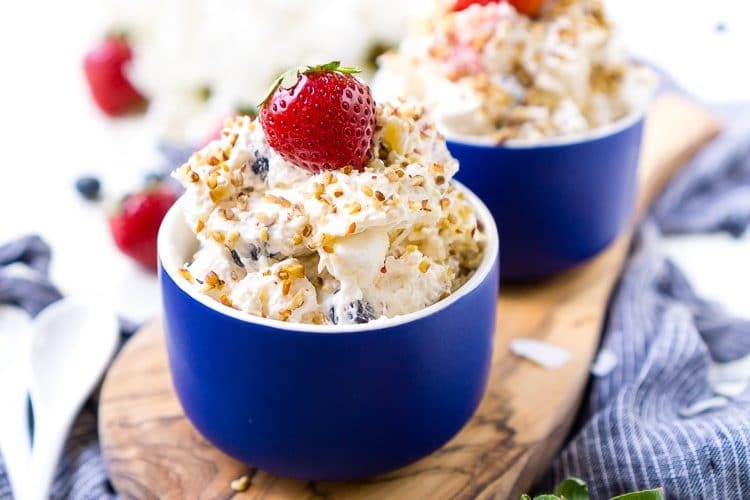 Many of us know ambrosia salad as the brightly colored fluffy stuff in the grocery deli or as a classic dish our mothers and grandmothers served up when we were kids. Originally a mix of oranges, coconut, and pineapple, ambrosia salads have been made with all kinds of flavors over the years. 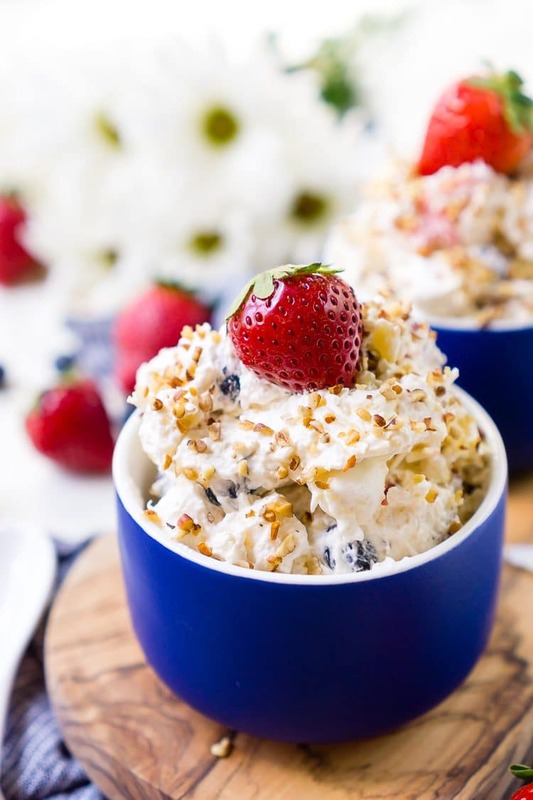 This one, in particular, celebrates the American summer and boasts delicious flavors of strawberries, blueberries, coconut, and pineapple, with a white chocolate whipped topping, fluffy marshmallows, and the crunch of pecans. 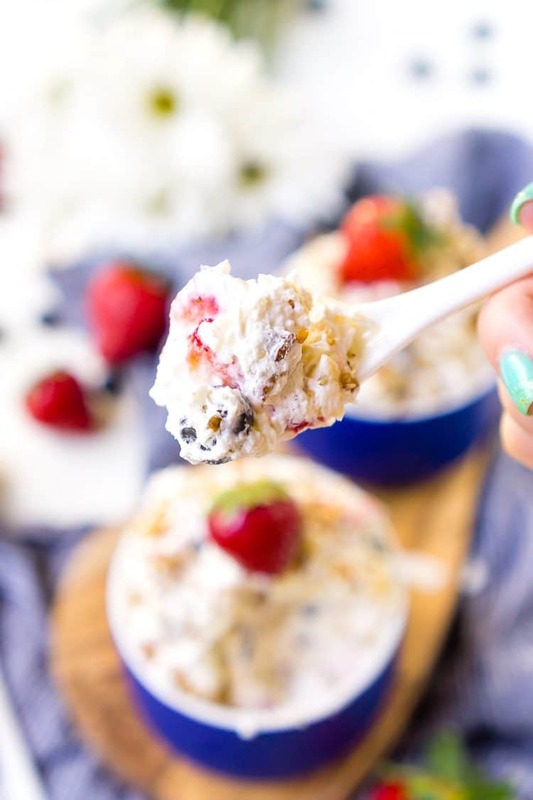 Mix it up in minutes and let it chill for at least an hour, then serve it up for your Memorial Day or Fourth of July BBQs or any other get-together you might have this summer! 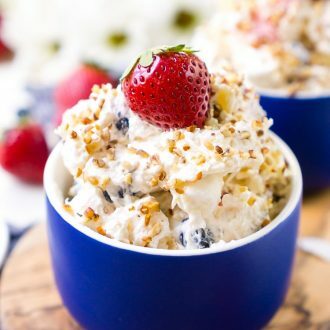 More Red, White, and Blue recipes! 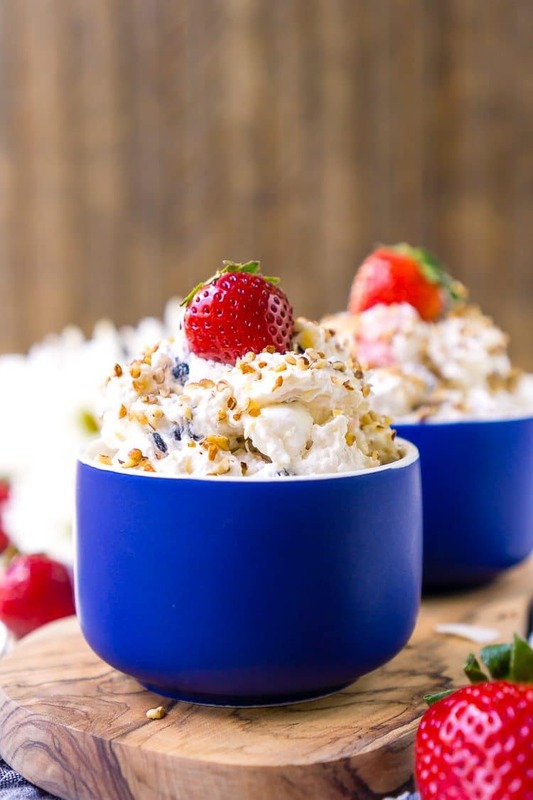 This Red White & Blue Ambrosia Salad is a delicious, no-bake, retro dessert recipe that's easy, addictive, and loaded with strawberries, blueberries, coconut, and pineapple! In a large bowl, mix together crushed pineapple and pudding mix, ounce combined, mix in the remaining ingredients. Chill for at least one hour, preferably overnight. What kind of white wine? I donʻt know anything about wines. Hi Davenie, there isn’t any wine in this recipe, were you trying to leave this on a different recipe? I look at in trying this out. Can’t wait making this and being creative with the fresh fruits in many families and friends yard, mine as well.